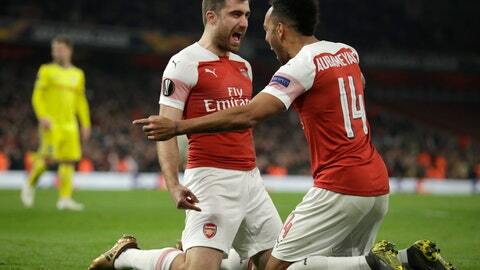 NYON, Switzerland (AP) — Chelsea was drawn to face Dynamo Kiev in the last 16 of the Europa League on Friday, and Arsenal will play French club Rennes without the suspended Alexandre Lacazette. Both London clubs are currently outside the top four in the Premier League, so the Champions League place awarded to the Europa League winner could be the best chance for them to return to the elite competition. Chelsea won the Europa League in 2013 but has recently dropped to sixth in the Premier League and was knocked out of the FA Cup by Manchester United on Monday. In another blow, Chelsea was banned by FIFA on Friday from signing players until the 2020 offseason transfer window for breaching rules covering youngsters. After Friday’s draw, UEFA announced that Lacazette would serve an additional two-game ban after being sent off for swinging an elbow at an opponent in the last-16 game at BATE Borisov. The striker was already suspended for the second leg on Thursday ahead of the UEFA disciplinary committee ruling that extended the sanction. Also in Friday’s draw, five-time champion Sevilla was drawn to meet Slavia Prague. In other matchups, it’s: Eintracht Frankfurt vs. Inter Milan; Dinamo Zagreb vs. Benfica; Napoli vs. Salzburg; Valencia vs. Krasnodar; and Zenit St. Petersburg vs. Villarreal. The first legs will be played on March 7 and the return games on March 14. The final is set for May 29 in Baku, Azerbaijan.